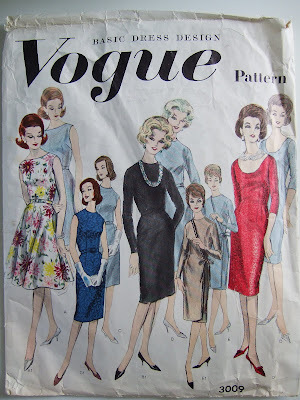 Vintage Vogue pattern, 69 cents. Five versions of a basic one piece dress. I don't see a year printed anywhere but I'd guess it's from the 1950's, and it has a larger style envelope. Isn't the fashion illustration just wonderful? Some of the pattern pieces are cut out too, so hopefully someone got a nice dress or two out of this pattern. Fabric, of course! Thrift stores are a great place to find fabric, at the very least for your muslins when you're fitting your garments. You can usually get several yards for <$2. This is the first time I did a fabric burn test which was pretty interesting. Now I see why acrylic fabrics should not be used for kids' clothes - that stuff does not want to stop burning! 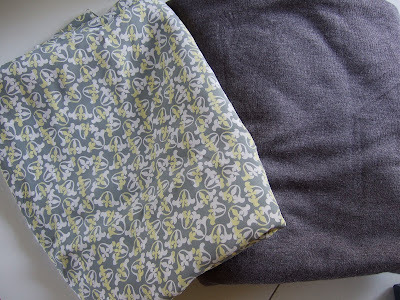 Grey, white & yellow print crepe, $1.50 for 3 yards, 38" wide - rayon. I will use this for a blouse or maybe a muslin. Heathered grey knit, $1.99 for 3 yards, 60" wide - acrylic. I suspected as much because this fabric is just so incredibly soft! It will be nice for some around the house/lounge pants. Also, I did make progress on the HP Ahoy There Sailor pants. I made a few pattern alterations and whipped out a second muslin. Now I'm ready to cut into the fashion fabric! i love that crepe! wait a sec, i don't wear yellow... i love that crepe anyway, but i'm not imagining it on me anymore. i think those patterns may be very late 50s/ very early 60s. that wiggle dress style with the belt is 60s, after everyone got sick of the full skirted New Look.